With playful visuals, Christmas Story will make a nice addition to a holiday bedtime-story reading list. A variation on a familiar holiday theme frames this whimsical, sincere, and beautifully illustrated picture book. 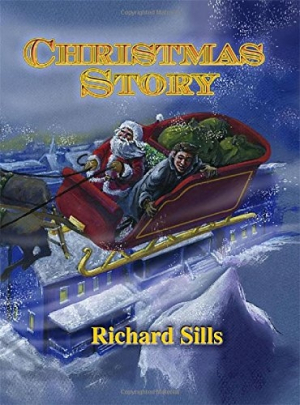 Christmas Story, written by Richard Sills and illustrated by Lori Maxwell, very clearly borrows from Clement C. Moore’s A Visit from St. Nicholas. It could be viewed as an alternate take on the well-loved poem. The text tells of a Victorian or Edwardian man who, as in the famous poem, awakens Christmas Eve to see Santa Claus. In this version, however, he is more than a mere observer, and joins Santa for a ride in the skies, ending with eggnog and biscuits. Santa promises the man that he, too, will receive a Christmas gift. In the morning, his children open gifts left under the tree, and the man learns that his gift is that his wife is expecting another child. The book tries very hard to emulate Moore’s tone and rhythm. While it succeeds in imparting a sense of the wonder and magic of Christmas, the writing is less mellifluous than Moore’s and feels derivative. “Through the night / We went, lit by Rudolph’s bright light. / For his nose, like the sun / Shown a path of fun.” What polish is lacking in the verse is, for the most part, overshadowed by the obvious love Sills feels for the subject. This enthusiasm couples especially well with the illustrations. Maxwell’s accompanying art doesn’t merely complement the text; it exceeds it. Her colorful work beautifully evokes the style of old Victorian illustrations and greeting cards. Each page is delightful and the characters’ faces never fail to bring a feeling of joy and excitement to the scene. The representations of Santa himself are especially lively. For all its fun, this book would not appeal to anyone looking for novelty. It positions itself very clearly in the traditional. For the all-around Christmas book enthusiast, Christmas Story’s levity and playful visuals will not disappoint. It would make a nice addition to a holiday bedtime-story reading list.